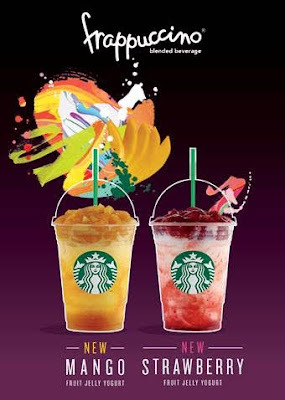 I'm a little perky today because Starbucks is serving two new Frappuccino flavors starting today until September 13. These are: Mango Fruit Jelly Yogurt and Strawberry Fruit Jelly Yogurt. Expect to get that much needed zesty boost with these new beverages boasting a delicious combination of chilled yogurt and fruity swirl blended with ice. These new fruity blended beverages are a delightful combination of fruity taste in a sweet jelly, layered with the smooth texture of yogurt. If you love the taste of refreshing and zesty sweet fruits, these two could just be the ideal beverage to chill up your hot day. Delight in the sweetness of fresh mango or strawberry perfectly balanced by a hint of tartness from the yogurt for a mouth-watering beverage. To energize your day, the Mango Fruit Jelly Yogurt Frappuccino perfectly blends honey-citrus sweet mango sauce with yogurt, topped with a layer of mango fruit jelly with real mango bits. Meanwhile, the equally refreshing and irresistible Strawberry Fruit Jelly Yogurt Frappuccino features a visual treat with the yogurt blended with strawberry sauce puree topped with strawberry jelly with strawberry bits. Starbucks continues to offer its patrons new flavor and texture combinations all the time to meet customers' taste and satisfaction.